To push the discussion forward, we told the teacher candidates that the field widely known as STEM (science, technology, engineering, and mathematics) is now being called STEAM (science, technology, engineering, arts, and mathematics). Adding arts to STEM was a declaration that history and humanities teachers should inspire student learning by using digital tools and inquiry-based learning activities more commonly associated with science and mathematics disciplines. Inspired to think more broadly, the teacher candidates began envisioning the possibilities of 3D modeling and printing for history/social studies education. One class member commented, “Representing historical events with a physical object could help students better understand and remember those events.” Another said, “3D printing could be a way to apply history to real life.” Everyone agreed that they wanted examples of how teachers and students were using 3D modeling and printing in classrooms. In this paper, we present findings from four case studies describing how teams of middle school level preservice and in-service history/social studies teachers incorporated 3D modeling and printing into lesson planning and instructional practices. The case studies included classes in world geography, U.S. history, and American government/civics. In these case studies, 3D modeling and printing were used as part of the study of the following required curriculum topics: Oil and water in the countries and economies of Central and South Asia; interactions between native people and European settlers in colonial America; use of memorials and memory in building civic understandings; and events leading to the American Revolution. These case studies offer classroom-based examples of how 3D technology can be used in history/social studies teaching. None of the participants—teachers or students—had experience with 3D modeling or 3D printing before the study, so their reactions were unfettered by past experience. Although the 3D activities were of short duration (i.e., parts of 2- to 3-weeklong instructional units) they offer lessons and insights for classroom teachers and teacher educators using this new technology in their schools and teacher preparation programs. Three-dimensional printers are machines that construct physical objects from 3D digital content (Johnson, Adams Becker, Estrada, & Freeman, 2015). To create a physical 3D model, a teacher or student must first design, import, or modify a digital model using 3D modeling software, such as Tinkercad, SketchUp, or Autodesk 123D. Online repositories provide access to free 3D models (e.g., Thingiverse, National Institute of Health 3D Print Exchange, and Smithsonian X 3D) that can be printed or modified by anyone. These online repositories are fueling the adoption of 3D printing (Johnson et al., 2015). Once a digital 3D model has been created, it must be put into a slicing software, such as Cura, to be prepared for printing. The slicing software is used to calibrate the 3D printer settings (e.g., set the temperature and extrusion speed) and define the parameters for printing the object (e.g., fill size, wall thickness, and size of the object). When the 3D digital model is ready to be printed, the user must connect the printer to the computer and then select the print feature within the slicing software. Most consumer-based 3D printers work by heating plastic (PLA or ABS) filament up to a certain temperature and then depositing the filament layer-by-layer on the print bed or plate. Thus, 3D printing is still a relatively slow process. Printing something as small as a penny might take 5–10 minutes, while printing a large object like a 6-inch sculpture might take a few hours, depending on the fill (i.e., percent of material used to fill hollow spaces in the model) and print speed. Technological advancements and lower purchasing costs are bringing 3D printers to an increasing number of K–12 schools. Machines that previously cost upwards of $20,000 each a few years ago can be now be purchased for less than $2,000, with budget models available as low as $300. As a result, elementary, middle, and high schools across the country are rushing to purchase 3D printers for computer labs and individual classrooms. MakerBot, a leading manufacturer of 3D printers, set a goal to put 3D technology in every school in the United States (Franzen, 2013). Teachers have a complicated relationship with technology in schools. Some history and social studies educators embrace instant access to online resources, while other teachers worry that technology is reducing students’ capacities for in-depth thinking and critical analysis (Hicks, Lee, Berson, Bolick, & Diem, 2014). In general, teachers believe technology will make their teaching more effective, motivate students to learn, promote positive classroom behavior, and teach important real-world skills (Schaffhauser & Nagel, 2016). Teachers mainly use technology, however, for record keeping, grading, professional communication, and delivering academic content through PowerPoint and video (Hartshorne & Waring, 2015; Swan & Hofer, 2008). In many classes, students mostly “use technology daily for drills and review than for project-based or collaborative assignments” (Rebora, 2016, para. 7). Many teachers say they are less certain that technology will produce higher academic achievement as measured by standardized test scores (Pressey, 2013). Even with computers in the classroom, history/social studies teachers may be reluctant to use 3D technologies, preferring to continue longstanding teaching methods of “lecture, whole group discussion, small-group work, reliance on the textbook and worksheets, homework, and tests” (Cuban, 2016). Wiggins (2015) estimated that half of all high school history/social studies teachers lecture during three quarters of most class periods. New technologies, like 3D printers, can promote more open-ended, student-centered learning experiences. In student-centered settings, “students exercise a substantial degree of responsibility for what is taught and how it is learned” (Cuban, 2008, p. 6). Many teachers find it difficult to imagine giving class time to students so they can develop 3D design projects. Other reasons history/social studies teachers may not consider using 3D technologies include a belief that 3D modeling and printing is appropriate only for mathematics and science classes. They do not see how 3D technologies can be directly connected to the study of the past. Other educators, noted Collins and Halverson (2009), see new digital technologies making “life more difficult for teachers” (p. 6). They may feel intimidated trying to learn a new technology or software tool that has little room for error. Like most technology integration efforts in local schools, teachers may not have support or training for using 3D printers in their classrooms. Some are also concerned that their authority in the classroom will be undermined if students know more about a technology than the teacher. Finally, the overall process of 3D manufacturing has a steep learning curve (Oropallo & Piegl, 2016). Creating a digital object using a 3D modeling tool (e.g., Tinkercad, SketchUp, or Maya) is a challenging task, and, as Oropallo and Piegl noted, “The CAD software that is currently in use for 3D printing was not designed with 3D printing in mind” (p. 137). They identified 10 challenges related to 3D printing, including shape optimization, design for 3D printing, pre- and postprocessing, printing methodologies, error control, and hardware and maintenance issues. Because consumer-based 3D printers are still in the early stages of development, users often face a variety of challenges, with the most time-consuming one being failed prints. Prints fail if they are not designed correctly or if the 3D printer has a glitch during the printing process. Even though 3D printers can offer seemingly unlimited possibilities for teachers, the steep learning curve and high failed print rate might dissuade teachers who are already strapped for time for learning and teaching. 3D printing is directly connected with two other emerging educational concepts: makerspaces and design-based thinking. A makerspace has been defined as “creative, DIY [do it yourself] spaces where people can gather to create, invent, and learn” (Kroski, 2013, para. 1). Design-based learning (DBL) is an open-ended process of trial and error, innovation, and iteration (Doppelt, Mehalik, Schunn, Silk, & Krysinski, 2008). Makerspaces and DBL activities are meant to encourage student-driven learning through exploration and the construction of artifacts. These activities help students develop creative thinking, inquiry learning, and problem-solving skills. Learning experientially has long been a goal of progressive educators. More than a century ago John Dewey (1916) urged teachers to “give the pupils something to do, not something to learn; and the doing is of such a nature as to demand thinking; learning naturally results” (p. 154). Writing at the beginning of the late 20th century’s computer revolution, Seymour Papert told teachers to shift their lessons from “instructionism” to “constructionism” (Harel & Papert, 1991, para. 17). According to Harel and Papert, “constructionism boils down to demanding that everything be understood by being constructed” (para. 3). That is, learning is a process of making and constructing knowledge, rather than ofreceiving information. Makerspaces and design-based thinking extend Dewey’s and Papert’s visions to schools, where students “participate actively in their own learning, with the teacher taking the role of a partner, a guiding influence, in the process” (Fleming, 2015, p. 3). In its Horizon Report: 2015 K–12 Edition, The New Media Consortium framed the introduction of 3D modeling and printing in schools as an integral part of the growing learning-by-doing movement, where students explore academic material “through the act of creation rather than the consumption of content” (Johnson et al., 2015, p. 14). The possibilities are limitless for 3D modeling and printing, they claimed, which enables exploratory and discovery learning in every subject field (p. 40). The report also said that 3D printing can “help students visualize graphs and mathematical models” and “better understand geological formations at scale” (Johnson et al., 2015, pp. 40-41). It offered few tangible examples, however, of how this technology was being used in history/social studies teaching. How do history/social studies teachers use 3D printers in their classrooms? What challenges do history/social studies teachers face when integrating 3D printers into lessons? We examined data from an initial study in which 13 in-service teachers from different disciplines, grade levels, and schools partnered with 10 preservice teachers to learn how to integrate 3D printing and modeling into their classrooms. The overall goal of the project was to document the experiences of teachers and students as they implemented their first 3D instructional activities. At the beginning of this project, the 23 teachers participated in two full-day Saturday workshops where they (a) received an overview of 3D printing and modeling, and (b) started to conceptualize ideas for curriculum projects. The workshops were organized so that participants could experience the design thinking and creation processes that are fundamental components of 3D printing and modeling. In the first workshop, participants brainstormed curricular and instructional uses of 3D models, engaged in an open-ended makerspace activity where they constructed physical objects, and received an introduction to Tinkercad, a 3D modeling software program. In the second workshop, the teachers worked more extensively with 3D modeling techniques by testing out one of the participants’ lesson plan ideas. The participants used a variety of hands-on design tools, such as building blocks, toothpicks, tape, paper, and Play-Doh, to create a physical version of a Native American dwelling. They recorded the steps of their design process and then used those steps to guide their design of a 3D digital model in Tinkercad. Then, the preservice/in-service teacher teams collaboratively brainstormed ideas for their own 3D printing lesson plans, which they shared with other members of the group to get feedback about how to integrate design technology in lesson plans across multiple subject areas. Nine participants focused on history/social studies curriculum topics. Three of these participants were preservice teachers who were enrolled in a teacher education program. Three participants were in-service history/social studies teachers who worked in middle schools located in suburban communities. The remaining three participants were in-service special-subjects teachers—one was a technology teacher, one was a school librarian, and one was an art teacher. The in-service participants’ years of teaching experience ranged from less than 1 to 18 years, with an average of 9.5 years. All of the participants reported a willingness to try out new technologies in a classroom setting, but none had used 3D modeling and printing prior to this study. Two of the teachers (the art teacher and a middle school history/social studies teacher), who worked in the same school, reported that they had access to a 3D printer in their school. Multiple sets of data were collected throughout the yearlong research study. At the beginning of the first workshop, the participants filled out a prestudy survey about their 3D printing knowledge, skills, attitudes, and ideas (e.g., “Do you believe that 3D printers are useful instructional tools? Why or why not?” and “What curriculum topics or content standards do you think 3D printing might especially support and enhance?”). We collected observational data during the workshops and encouraged participants to fill out postworkshop surveys to explore how teachers learned to incorporate 3D printing and modeling into their lessons. We collected observational data as participants implemented the 3D printing lessons in their classrooms and then followed up with 30- to 60-minute interviews with each of the participants. During the interviews, participants were asked to describe, reflect upon, and evaluate their 3D printing lesson. They were asked to share what they learned, what challenges they faced, and what advice they could give to other teachers who might be interested in using 3D printers in their classrooms. We conducted focus groups for students from two of the history/social studies classrooms (i.e., Water Conservation Technologies and American Revolution Board Game). The other two projects took place at the end of the school year, and we were unable to conduct focus groups with students in those projects due to timing. We conducted a thematic analysis (Braun & Clarke, 2006) of the data to identify similarities and patterns across the datasets. We reviewed the data separately and recorded our initial impressions (Saldaña, 2015). Then, we met to discuss our initial impressions and identify common themes. We reviewed the data again and collaboratively identified seven important lessons and insights for educators who are interested in using 3D printers in history/social studies classrooms. Following the workshops, each teacher team developed a curriculum project connecting 3D printing to required learning standards in their school curriculum. The four middle school teacher teams designed unique lessons that covered different curriculum standards for eighth grade U.S. history (Table 1). Each project is detailed in the following section. A seventh-grade preservice/in-service teacher team incorporated 3D modeling and printing into their water resources unit. The unit focused on access to and use of oil and water in Central and South Asia. Throughout the unit, 73 middle school students in four separate classes explored issues such as human impact on water, access to clean water, water footprint, climate, and water conservation. At the end of the unit for this school, students traditionally showcased their understanding of the topic by creating a nonfiction picture book. However, when one of the students asked whether the leftover water from washing hands could be used to fill the toilet, the in-service teacher identified an opportunity for incorporating 3D printing. The in-service teacher revised the lesson to allow students to have a choice for their final assessment: (a) Design a nonfiction picture book or (b) create a 3D model related to water conservation. A total of 15 students, working alone or in groups, designed 3D models as their final unit project. The students were encouraged to sketch their design ideas on paper using multiple perspectives before trying to create a 3D digital model using Tinkercad. One of the students said that each member of her group went home, sketched ideas for a model, and then came together during class the next day to select a design. Once the design was selected, this student described how she and her group members drew the design from different perspectives to help with the development of a 3D model and then worked in Tinkercad to create the 3D digital model. While some students followed this step-by-step design process, others decided to “wing it,” jumping right into the construction of a 3D model in Tinkercad. However, upon reflection of the design process, those who did not create drawings with multiple perspectives or use the Tinkercad tutorials said that they struggled much more than the other students. Although one student reported that using Tinkercad was easy because he watched tutorial videos at home, the rest of the students found the 3D modeling program to be challenging. Designing a 3D digital model for printing requires using a 2D interface (i.e., a computer or smart device) to construct a 3D digital object. Some students said that navigating a 3D space using a computer keyboard or mouse was hard. 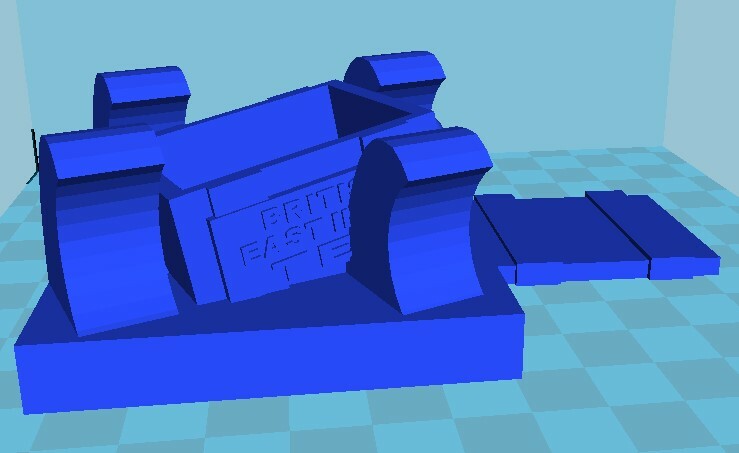 Others said that the Tinkercad tutorials did not provide them with enough information to construct their detailed designs. The in-service teacher requested support from our project team. We were able to recruit college students from a tutoring course to help the middle school students create their designs in Tinkercad. Although the students found Tinkercad challenging and frustrating, all of them were able to build a printable 3D model with the assistance of the tutors. Figure 1. 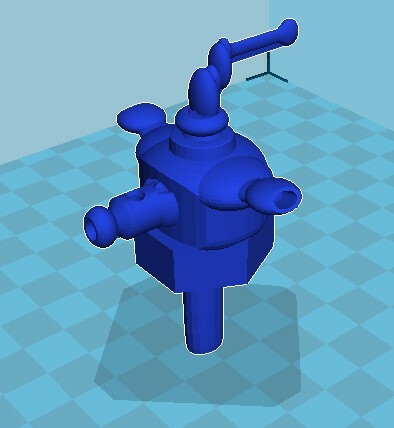 3D digital model of a water filter. A second history/social studies 3D printing project involved eighth graders working in groups of three or four to design the pieces for a board game, called “Road to the Revolution.” The board game project was organized around the key events leading to the American Revolution, including the Boston Massacre, the Boston Tea Party, the battles of Lexington and Concord, Paul Revere’s Ride, and the Battle of Bunker Hill. The focus on this particular topic was especially relevant because the American Revolution is a key topic in the Massachusetts statewide curriculum framework for history and the social sciences. At the beginning of the project, the students collaboratively conducted research about their American Revolution event and then brainstormed ideas for how to represent the event as a board game piece. The students worked with the school’s arts integration teacher to turn their sketches into physical models. The student groups were given the option to create a 3D digital model of their design. Using Tinkercad, 10 students created 3D objects for the game, producing professional-looking game pieces while developing research reports about their importance in the revolutionary era. The students said that building a 3D digital model allowed them to create more detailed designs than they could with traditional cardboard and clay. Like the students in the water conservation project, however, these students struggled with using Tinkercad. Some students found it too simple for their designs, while other students were challenged with figuring out how to make their designs printable. One preservice teacher for this project noted that the students “had actually really good ideas but it was really hard to replicate some of the designs they created in physical form.” A preservice teacher worked one-on-one with students to help them make modifications to their designs to ensure that they were structurally sound. The teachers also encouraged students who were familiar with 3D modeling to teach and support their classmates during the 3D modeling design process. [It] took one day to explain the project with all the parameters, 2 to 3 days [for students] to research, a day for sketching and planning, and then the rest of that week for building a 3D model. And then a day the following week for basically ironing out all the technical issues and then two days to play the game. Figure 2. 3D digital model of the Boston Tea Party. A middle grade civics/government class developed its 3D printing project in conjunction with the school’s yearly field trip to the nation’s capital in Washington, DC. In preparation for the trip, the students discussed the monuments and memorials they would be visiting or reading about, including the Washington Monument, Lincoln Memorial, Jefferson Memorial, Martin Luther King Jr. Memorial, Vietnam Veterans Memorial, and Korean War Veterans Memorial. They also learned about some of the city’s other historic landmarks, including the White House, the U.S. Capitol, the Supreme Court Building, and the Smithsonian. Noting the significance of publicly celebrating important people and events, the teacher asked the students, “What do the current monuments commemorate, and who do you think is missing among Washington, DC’s memorials and landmarks?” After visiting historic sites across the nation, Loewen (1999) had found prevailing racism in who is honored and how, declaring that “Americans still live and work in a landscape of white supremacy” (p. 2). Analyzing who gets memorialized and who gets left out, Loewen found few tributes to native peoples, women, or gay and lesbian individuals. In Loewen’s view, “the landscape suffers from amnesia, not about everything, but about many crucial events and issues of our past” (p. 4). After discussing the theme of Loewen’s book and the importance of uncovering “hidden and missing histories,” the students set forth to identify individuals who significantly shaped history but who have been left out of history textbooks and have not been honored with monuments and memorials detailing their accomplishments. After discussion and debate, the students selected the following individuals: Sojourner Truth, Sacagawea, the Suffragettes, Hedy Lemarr, Betsy Ross, Bill Gates, Harriet Tubman, Maurice Hilleman, Helen Keller, Rosie the Riveter, Margaret Sanger, Mae Jemison, and Maya Angelou. They set forth to design and print historical monuments honoring the struggles and achievements of these individuals (Figures 3-4). Figure 3. 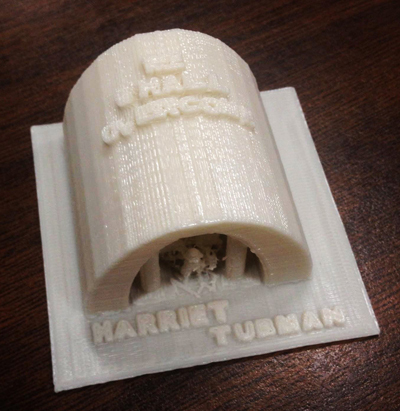 3D model of a monument designed for Harriet Tubman. Students explored the influential men and women in history pages on the resourcesforhistoryteachers wiki (http://resourcesforhistoryteachers.wikispaces.com) prior to selecting their topic. The students were also required to create a plaque to provide context for their monument. The resourcesforhistoryteachers wiki provided students with the dates, key accomplishments, and lasting impact of the influential men and women in history. This information allowed the students to write a concise plaque to memorialize and honor their individual. Before jumping into design using Tinkercad, students were required to sketch out their ideas to help them visualize their monuments (e.g., Figure 4). This step created some anxiety for students who were not comfortable illustrating. However, engaging in the action of illustration encouraged students to move the ideas from their heads onto paper. Figure 4. 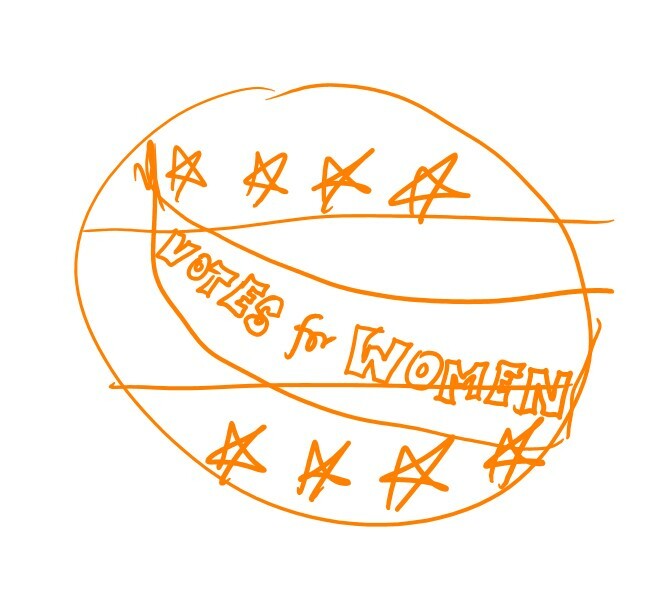 Sketch for a 3D model, “Votes for Women,” a slogan for Suffragettes. The students were excited but apprehensive about the project upon learning they would be creating their own 3D design, as none of them had experience in creating a digital object of any kind. The tutorials in Tinkercad allowed students to work through the process of designing products at their own pace. The tutorials were key, as some students needed more support than others. As students worked through the tutorials and became comfortable with the programming, they happily assisted each other, serving as experts in the classroom. The students had eight 60-minute-long class meetings to complete their design. Once the designs were printed, the students hosted a monument walk for each other. The plaques students wrote were placed in front of their monuments. A plaque written by a student for the first African American woman to travel in space read in part, “Mae Jemison is a truly extraordinary woman, who both broke barriers, and was unapologetically herself while doing so.” Students walked around the tables of monuments, learning about hidden histories from each other and admiring each other’s work. The goal of the project was to use 3D models designed by the students to compare and contrast cultures and lifestyles. Settlers arriving in Colonial New England sought to recreate the patterns of traditional European society. They built log cabins enclosed in small villages and viewed land as private property owned by individuals and families. By contrast, native peoples in North America “constructed homes to conform to their needs and environment” (Schwartz, n.d., para. 1). Land was owned by the tribal community and used to meet collective needs. Having the opportunity to design dwellings was a way for students to actively explore Native American heritages. To showcase how Native Americans lived throughout North America, teams of students designed 3D representations of different dwellings and then reported on the culture and lifestyle of the people who lived in them. The design process consisted of three phases. In the first phase students learned about which Native American nation they would represent through their model. The students crafted models using mostly pipe cleaners and sticks to illustrate the structures they would pursue in the digital design. In the second phase, students explored the 3D modeling tool Tinkercad and designed a dwelling on the computer. Finally, students visited the MakerBot Innovation Center at the library of the local university where they could see their designs being printed. [The students] learned that it’s okay to make mistakes and that there are spaces for them to practice making mistakes in school. I think that too often students feel pressured to either only give the verifiable “true” answer or stay silent because they may not know enough for a substantial explanation or they don’t want to take a chance at “knowing.” I wanted to encourage them to use this space to explore and to fail, in addition to succeed; success without failure is not true success. In contrast to a one-right-answer approach found in many classrooms, this hands-on project created a space for the students to develop designs, try them out, and revise their work based on the results. This project also integrated academic concepts from multiple subject areas. In support of an interdisciplinary learning model, this project combined topics of history with measurement calculations from mathematics and CAD (computer­animated design) modeling from science and engineering. The teacher reported that many of the students expressed interest in STEM fields for their future career paths that would include 3D printing technology, in part because of how comfortable they felt with the 3D modeling software. Figure 5. Students’ 3D models of Native American dwellings. The 3D Printing 4 Teaching & Learning project was designed to document the emerging attitudes, knowledge, and practices of current and future teachers as well as public school students at a time when a dynamic new technology is being integrated into K–12 school classrooms. Because 3D modeling and printing is more commonly associated with mathematics and science education, we chose to focus specifically on an underresearched area: the responses of middle school history/social studies teachers and students. We wondered how they would use this technology and what challenges they would face integrating it into classroom teaching and learning. 1. Teachers and students found it challenging to imagine how to use 3D printed physical objects to represent historical events or social science concepts. While both teachers and students found the idea of 3D modeling and printing intriguing, they were initially unsure how to connect this technology to school district-mandated, standards-driven curriculum topics. It took time to make choices about what designs should look like and what they would represent as they explored issues of water conservation, Revolutionary War events, Native American dwellings, or the accomplishments of individuals who have been neglected in history books and public memorials. As one of the teachers commented, “One of the biggest [struggles] was getting started. You know, in terms of the design, what should it look like, what are the ideas?” To support creative thinking, the teachers encouraged students to conduct in-depth research about the topic, brainstorm and discuss ideas with peers, and sketch out their ideas on paper. Some of the students also explored online repositories of 3D models, such as Thingiverse, to get ideas for their project. The projects were a success, as students in every class produced interesting designs based on creative ideas that teachers could then connect to key curriculum content. 2. For some students, 3D printing projects were a positive, fulfilling way to show their ideas that transcended talking and writing about situations and concepts. In most history/social studies classes, students express themselves using spoken and written words. For some learners, this expectation makes history or social studies one of their least favorite classes—they do not enjoy inserting their ideas into classroom discussions and interactions. Through 3D modeling and printing, in contrast, students had an opportunity to generate a tangible object that communicated their thinking. Designing an object rather than writing or talking in class was an inspiring change to classroom learning, a way to express their imagination and creativity naturally. An in-service teacher said, “I think for some kids, I think it’s really helpful to create something that’s physical to represent their idea.” An preservice teacher commented, “Once you reach eighth grade [social studies] becomes more writing based, more reading. Designing things and physically creating some of the actual stuff that we are learning about really helps some students.” In short, 3D printing in this project appeared to enable the teacher to engage students with diverse learning styles by offering them a different way of expressing themselves and learning about the content. 3. Teachers and students found the 3D modeling program Tinkercad difficult to use at first. In the educator workshops, the teachers, especially those who had never expressed design ideas using computer-generated images, struggled to use what for them was a unfamiliar digital technology. Several students were openly frustrated and needed reassurance and support to continue using the modeling software. Students also expressed frustration but were more eager to learn the technology. Some students who felt the Tinkercad tutorials were boring or not relevant to their designs skipped the tutorials and tried to figure things out on their own. Others felt Tinkercad was too simple and did not allow them to achieve the level of detail they wanted in their 3D designs. Many students suggested allowing additional time to play around with Tinkercad and explore the tutorials before starting the design project. Teachers may mitigate these concerns by creating a low-tech makerspace where students construct physical objects to represent their designs before using the Tinkercad program. We used a similar approach in the teacher workshops where participants used building blocks (CitiBlocs), Play-Doh, K’NEX blocks, Perler beads, and other hands-on materials to construct designs. Moving from a hands-on maker activity to a computer-based design activity enabled teachers to focus on their ideas rather than be discouraged by the unfamiliarity of software and technology. At the same time, creating physical objects, followed by 3D modeling on the computer, enabled participants to gain confidence in their design skills. Including a low-tech makerspace in a lesson plan may help students overcome some of the challenges that are experienced when using 3D modeling for the first time. The teachers in our study also provided suggestions for improving the 3D modeling experience for students. Upon reflection of the 3D printing and modeling projects, most of the teachers in our study recommended providing students with time to play and explore in Tinkercad before starting their projects so they could become more comfortable with this tool. Moreover, they suggested allowing students to use more advanced 3D modeling software, such as Google SketchUp or Autodesk 123D. One of the teachers also recommended having computer mice available for students who use laptops because using the trackpad was too challenging. 4. 3D modeling and printing altered the teacher-as-expert/student-as-novice relationship. In history/social studies classrooms, the teacher is a recognized expert, possessing extensive content knowledge along with years of teaching experience. It is assumed that teachers know more about the academic material than do the students. In 3D design, however, that teacher-as-expert/student-as-novice hierarchy was less present. Even though none of the teachers or the students had done 3D modeling and printing previously, the students were more comfortable with, and more generally knowledgeable about, the technologies used in the modeling and printing process. Most students were ready to turn on the computer and begin learning the Tinkercad software, while many teachers wanted training and preparation beforehand. Student familiarity with technology was an unsettling reality for teachers—one educator lamented that students might learn how to use the tools faster than he did. One of the teachers said that when she presented the 3D printing and modeling project, she told the students that they would be learning together: “We were honest by saying, ‘This is new for all of us and it is a new technology. That is just going to be our lives and we have to adapt and work through the uncomfortableness.’” This new dimension of the teacher/student relationship represents a fruitful area for further research—especially whether this alteration might change other aspects of how teaching and learning is conducted in history/social studies classrooms. 5. 3D modeling and printing changed the way teaching and learning happened in history/social studies classrooms. By focusing on active learning, problem solving, design-based thinking, and collaborative group work, 3D design activities altered longstanding patterns of teacher-centered presentations to students who were expected to passively receive and remember information. Students endorsed the modeling and printing experience, noting that creating designs and objects helped them remember people and events more specifically. 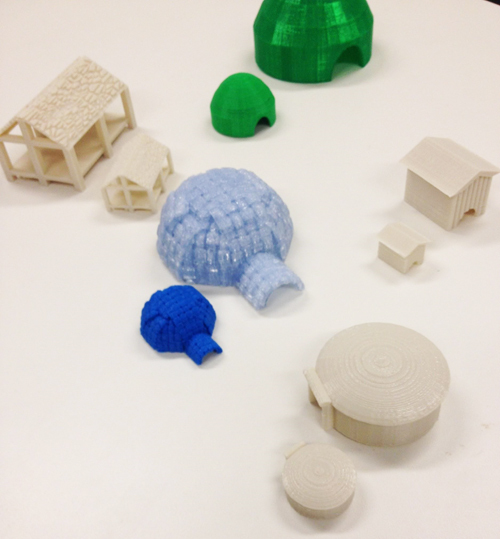 Multiple students said that printing objects allowed them to visualize causes and consequences of events. Students also reported that they learned they could be creative in school projects, and many even took the initiative to use 3D printing in other school projects as well. Teachers also saw benefits to the design process, less in terms of students remembering specific information and more in terms of how it activated individual creativity by allowing students to pursue areas of personal interest and self-expression. 6. Teachers benefitted from having support from content and technical experts. In each of the projects, one of the authors, who coordinates the university’s history teacher license program, served as a content coach for the history/social studies teacher teams. He offered ideas for how to connect 3D modeling and printing to relevant history content standards. He met with the teams, researched each of the history, geography, and government topics, and engaged in ongoing discussions about project activities. The teachers also accessed resourcesforhistoryteachers, a wiki developed by one of the authors, that links online resources to state and national history content learning standards. In a related, but also important connection, college tutors from the university helped the teachers and students at one of the middle schools learn the Tinkercad modeling program. For the Native American Dwellings project the preservice teacher partnered with the school librarian and technology teacher for content and technical support. Identifying local support, including content and technical experts, may be an important ingredient to the integration of 3D technology in classroom settings. Given that teachers may be skeptical about 3D printing until they see it in action, college and university teacher educators and school system staff developers should incorporate discussions about how 3D printing and modeling can add value to students’ learning experiences across all disciplines, including social studies/history. Through such conversations and dialogue, teachers—both new and experienced—may be more inclined to incorporate this innovative new technology in their classrooms. After studying patterns of constancy and change in American education from 1890 to 1990, historian Larry Cuban (1993) declared that throughout that century teacher-centered instructional practices “seemed uncommonly stable at all levels of schooling” (p. 5). Despite updating his research, he reached similar conclusions in his 2016 book, Teaching History, Then and Now. In K-12 schools, particularly at the middle and high school levels, history teachers mostly present information through lectures and electronic slideshows, while students take notes and complete information-recall worksheets. Cuban is hardly alone in his assessment. Despite the advance of historical scholarship and the arrival of new technologies, students in many schools analyze few sources, read little historical literature, and engage in limited simulations or projects in their classes (Barton & Levstik, 2008; Parker, 2015). Teacher-centered instructional approaches run contrary to current research on the science of learning. Known as constructivism, the foundation of that research was presented in the seminal report, How People Learn: Brain, Mind, Experience, and School, and follow-up studies focusing on teaching and learning in mathematics, science, and history (Donovan & Bransford, 2000, 2005a, 2005b, 2005c). Constructivists argue that students need to be mentally and physically engaged in order to learn new ideas and concepts; otherwise, academic information is soon abandoned, and youngsters return to previously held assumptions and misconceptions (Costa & Kallick, 2014; Dean, Hubbell, Pitlier, & Stone, 2012). Teachers need to adopt metacognitive approaches to instruction, featuring inquiry-driven activities that give students opportunities to exercise direction and choice over their learning, while still providing a foundation of basic knowledge in various disciplines (Zemelman, Daniels, & Hyde, 2012). As summarized by Wineburg, Martin, and Monte-Sano (2013) from the Stanford History Education Group, inquiry-based learning focusing on questions important to students can function as an “alternative to the vicious cycle of teaching students facts that will soon evaporate into thin air” (p. ix). The responses of teachers and students to the 3D Printing 4 Teaching & Learning project suggest that having students model, design, and print 3D objects related to standards-based historical topics can create a framework for active, engaged learning in the history and social studies classroom. Each of the history projects incorporated 3D technologies into the schools’ required curricula. Each project asked students to function as researchers, designers, and presenters of information. Each project involved group work and hands-on activity that is the antithesis of passively receiving information from a teacher or a book. 3D projects like the ones showcased in this paper provide students with what Larson (2017) has characterized as the essential elements of history and social studies education—knowledge, skills, and dispositions. Knowledge refers to the facts and concepts of the history curriculum, and each project focused on important historical and contemporary information about people, places, and events. Skills are the abilities that students are expected to learn; each project gave students opportunities to practice not only historical research, but also the use of 3D technology. Dispositions are the habits of mind that students need to learn in school; each project emphasized the importance of self-expression through design, as well as perseverance in learning to use 3D tools. Based on the results of the 3D Printing 4 Teaching & Learning project, devoting hours of class time to 3D projects when there is so much material to teach and so little time in which to teach seems a worthwhile tradeoff. Through inquiry and design, students constructed historical knowledge for themselves and shared their ideas with peers. The objects created by 3D printing served as markers of that knowledge, creating tangible visual entry points to the study of historical patterns and forces. In this way, one of today’s newest technologies can create new ways to learn about the past. Barton, K. E., & Levstik, L. S. (2008). Teaching history for the common good. Mahwah, NJ: Lawrence Erlbaum Associates. Costa, A. L., & Kallick, B. (2014). Reframing teaching and learning. Thousand Oaks, CA: Corwin Press. Cuban, L. (1993). How teachers taught: Constancy and change in American classrooms 1890–1990. New York, NY: Teachers College Press. Cuban, L. (2008). Hugging the middle: How teachers teach in an era of testing and accountability. New York, NY: Teachers College Press. Cuban, L. (2016). Teaching history then and now: A story of stability and change. Cambridge, MA: Harvard Education Press. Dean, C. B., Hubbell, E. R., Pitlier, H., & Stone, B. J. (2012). Classroom instruction that works: Research-based strategies for increasing student achievement (2nd ed.). Alexandria, VA: Association for Supervision and Curriculum Development. Donovan, M. S., & Bransford, J. D. (Eds.). (2000). How people learn: Brain, mind, experience, and school. (Expanded ed.). Washington, DC: National Academies Press. Donovan, M. S., & Bransford, J. D. (Eds.). (2005a). How people learn: Mathematics in the classroom. Washington, DC: National Academies Press. Donovan, M. S., & Bransford, J. D. (Eds.). (2005b). How people learn: Science in the classroom. Washington, DC: National Academies Press. Donovan, M. S., & Bransford, J. D. (Eds.). (2005c). How people learn: History in the classroom. Washington, DC: National Academies Press. Harel, I., & Papert, S. (1991). Constructionism: Research reports and essays, 1985-1990. Westport, CT: Praeger. Johnson, L., Adams Becker, S., Estrada, V., & Freeman, A. (2015). NMC horizon report: 2015 K–12 edition. Austin, TX: The New Media Consortium. Larson, B. E. (2017). Instructional strategies for middle and high school social studies: Methods, assessment and classroom management. New York, NY: Routledge. Loewen, J. W. (1999). Lies across America: What our historic sites get wrong. New York, NY: Simon & Schuster. Parker, W. C. (Ed.). (2015). Social studies today: Research and practice. New York, NY: Routledge. Pressey, B. (2013). Comparative analysis of national teacher surveys. New York, NY: The Joan Ganz Cooney Center at Sesame Workshop. Saldaña, J. (2015). The coding manual for qualitative researchers (3rd ed.). London, England: Sage. Schaffhauser, D., & Nagel, D. (2016, September). Teaching with tech: A love (and hate) story. THE Journal, 43(5), 6–15. Swan, K. O., & Hofer, M. (2008). Technology and social studies. In L. S. Levstik & C. A. Tyson (Eds. ), Handbook of research in social studies education (pp. 307–326). New York, NY: Taylor and Francis. Wineburg, S., Martin, D., & Monte-Sano, C. (2013). Reading like a historian: Teaching literacy in middle and high school classrooms. New York, NY: Teachers College Press. Zemelman, S., Daniels, H., & Hyde, A. (2012). Best practice: Bringing standards to life in America’s classrooms (4th ed.). Portsmouth, NH: Heinemann.